AP Photo/David Eggert MICHIGAN GOV. 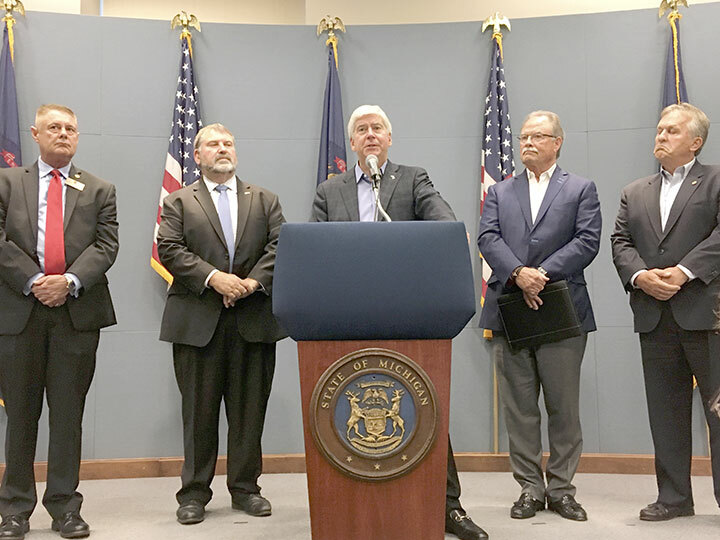 RICK SNYDER announces support from the business community for his proposed fee increases to pay for environmental cleanup and water infrastructure needs. Also shown, from left, are Republican state Rep. Larry Inman, Michigan Farm Bureau President Carl Bednarski, Michigan Chamber of Commerce President and CEO Rich Studley and GOP state Sen. Mike Nofs. LANSING, Mich. (AP) — Two influential Michigan business groups on Thursday got behind fee increases proposed by Republican Gov. Rick Snyder to pay for environmental cleanup, water infrastructure and recycling needs, saying they will push the GOP-led Legislature to act before he leaves office at year’s end. It would raise the landfill dumping fee from 36 cents per ton — which is higher than five other Great Lakes states — to $3.99 per ton, which Snyder said would still be lower than the regional average. It would cost households no more than an additional $3.99 a year.